Is your energy level low all the time? Do you feel like you are walking around in a fog? Are your mood issues and bowel problems keeping you from living a normal life? As a functional medicine nutritionist, I’ve watched thousands of people have their symptoms melt away on The Elimination Diet...skin problems, mood issues, gut disorders, headaches, chronic pain, and more. By simply (and deliciously) modifying their diets, people just like you are reversing their conditions and eliminating their most troublesome symptoms. In fact, many people continue to improve so much that they no longer need their medications! I’d like to introduce you to the Elimination Diet. More than a typical plan, it is a simple method of identifying and removing all potentially problematic foods from your diet until your symptoms subside—usually within a few days to weeks. Then you slowly reintroduce foods back into your diet, one by one, to see which ones bring your symptoms back. By finding the foods that are behind your suffering, you can completely turn your health around and elevate your quality of life. This complete functional medicine resource, like no other book, explains how digestion works, your body’s reactions to toxins, how to navigate each phase of the Diet, and more. You’ll also find 125 delicious recipes, shopping lists, and meal plans. Order the harcover book online or find it at any major bookseller. If you would rather listen to me read the book, then you can Order the Audio Book. Sign up for our Support Program: Do you wish you could have a personal coach while going through this process? Now you can! In our online Elimination Diet Support Program, you will have 6 live meetings/webinars with me where I will share inspirational stories and secret nutrition tips that will help you bring your energy back and help let go of your pain faster than you thought were possible. Within these live webinars we will also have the opportunity to dive deeper into complex digestive disorders and specific disease states so you can tailor your Elimination Diet and get results faster. Ali will be welcoming you into our kitchen with her warm teaching style while she demonstrates some of our favorite recipes in her 26 cooking instruction videos. You will also be having life-changing discussions with other past and present Elimination Diet Program participants in our private Facebook support group. Need more recipes? We've got you covered! Ali has compiled some of our favorites in full-color PDF documents with gorgeous photos to get your mouth watering in anticipation. We offer live programs regularly throughout the year. Click here to find out when our next live program takes place! Order Supplements: Confused about what supplements work for what condition? What about how much to take and when? I was a medical affairs member of one of the world's top supplement manufacturers. It was there that I did countless hours of research, development, and education on varying products including a highly absorbable form of CoQ10, a cutting-edge amino acid supplement to preserve lean muscle mass and increase energy, and the world's most bioavailable curcumin (turmeric) supplement that is so effective it can replace Tylenol. If you have gut issues, low energy, or mood problems, I have personally designed packages of supplements to support these conditions and enhance your experience on the Diet. Have questions about which supplements to choose? Ask me in the comments below! Listen and learn from the most recent Podcasts, Video Interviews, and News Segments! We've compiled all of the most recent media links and added them to one page! Listen in and empower yourself with new information here! 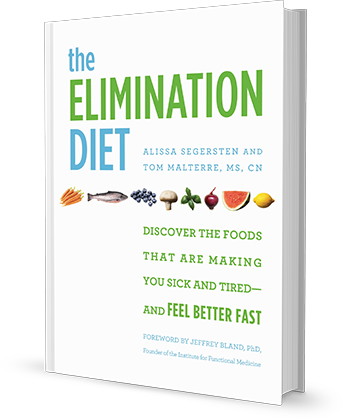 Would you like to test out four delicious Elimination Diet recipes now? Get your FREE recipes with Ali’s cooking instruction videos and more information about the Elimination Diet. You won’t be disappointed; the recipes are great! We hope you enjoy all of the resources we've put togther for you.....and we can't wait to hear about your experiences and success stories! Which supplement package to get? I have your new book and am excited about doing the program. The only problem is I am vegetarian and am concerned about getting enough protein as you are recommending eliminating nuts, seeds, legumes and so forth. Is the only way to make sure I am getting the protein needed to eat meat? I hope not!! Hi, iam a vegetarian and don't eat eggs as well. Without nuts and legumes how will I get my daily dose of protein. I'm getting excited to start the Elimination Diet tomorrow. I've read your book, ordered the cookbook, started 5 quarts of fermented veggies, have a full jar of broccoli sprouts at the ready and just made two large pots of soup to eat during Phase I. I also have more fresh produce and herbs stocked in my fridge then it's ever seen at one time! The kitchen smells so good. I'm not only looking for the results (the goal is to clear up my scalp psoriasis that I've suffered with for 20 years, have more energy and less anxiety), but I'm also looking forward to the process. I'm looking forward to eating more fruits and veggies, and establishing good habits that hopefully will last the rest of my life. I do believe I cook healthy and nutritious foods for my family, but I'm seeing how much more I can improve. It certainly is a process. So- this is to good cooking and healthier living! I know that whatever the outcome it will be a win/win situation for me and my family. Hi..I am interested in the elimination diet...I have many issues like colitis, candida, leaky gut, dairy and gluten intolorant, fybromialgia to name a few...I know...lucky me!!! Would this elimination diet be good for me??? I'm mostly concerned about the recipes because I can not have sugar in any form including honey or agave, yeast, almonds, fruits (sugar content) and of course anything with gluten and dairy...I'm at my wits end...Help!!! Around 2,000 - 2,001 my health seemed to start spiraling downward. I was diagnosed with RA ( it was really inflammation ), became Type 2 diabetic and later Type 1, noticed more and more irritation, illogical anger, less ability to focus on tasks, and less caring about my family, work, and other people. I was eventually diagnosed as having Chronic Fatigue and had to quit work. I've improved from the depths of where I was, but I still have depression, brain fog, anxiety, fatigue, congestion in my sinuses, and pain in my joints after "hard" work. I already don't consume sugar, alcohol, caffeine, tobacco, or drugs and tried going gluten-free for several months. What results can I realistically expect from this diet, and has anyone else with similar symptoms had positive results? Thanks for everyone's years of work and experiences! Sick and Tired and tired of it. I accidentally found this book at the book store. I have taken my time in reading it. I am anxious to start, however, I am taking my time to set myself up for success. I am hoping this will address other food issues and give me back energy.